Consisting of only 7 ingredients and taking 10 minutes to throw together, this cornbread crisps around its edges thanks to melted butter coating the cast-iron skillet the batter bakes in. The cornbread is tender thanks to buttermilk and melted butter, and this cornbread recipe is also conveniently gluten free because cornmeal is naturally gluten free, just make sure that the cornmeal you are using is certified gluten free and not processed in a plant that also processes wheat. Most local cornmeal brands only process corn and are gluten free, so look at the labels on the bags at your grocery store. Preheat oven to 400°F. Place a 9-inch cast-iron skillet in the oven to preheat with the oven. In a large mixing bowl, whisk together buttermilk, eggs, 5 Tbsp. melted butter, and salt. Stir in baking powder, baking soda, and cornmeal until fully incorporated. The batter should be loose but without any lumps. Remove cast-iron skillet from the oven and pour in the remaining 2 Tbsp. melted butter, carefully swirling the skillet to coat it in butter. Pour batter into skillet and bake until golden brown and until a toothpick inserted into the center of the cornbread comes out clean, 38 to 40 minutes. If you prefer sweetened cornbread, stir in 2 Tbsp. granulated sugar in Step 2. 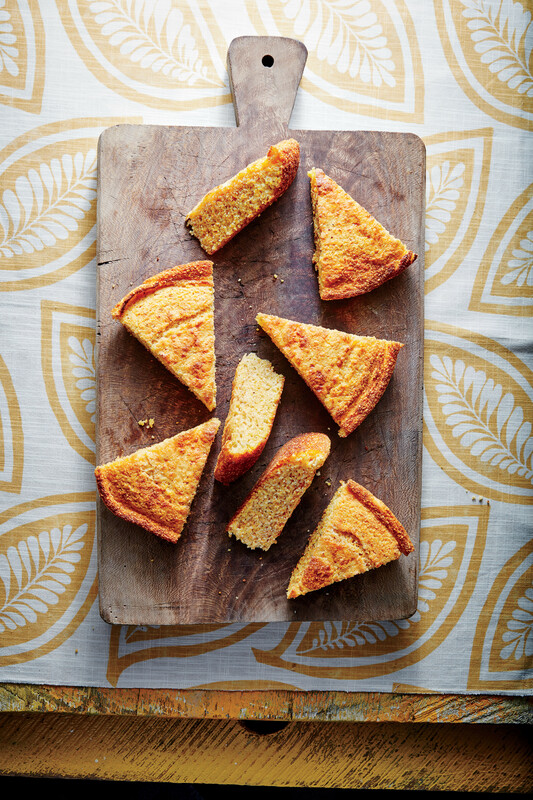 This cornbread is also easy to customize by adding ingredients to the batter. Feel free to stir in cooked pieces of bacon, fresh chives, jalapeño pepper pieces, shredded cheese, or fresh corn kernels.